The first Nicholas Helfenstein (later Helverson) in this country was the first undertaker in the family. His two sons, William and Horatio, continued together in the undertaking business until Horatio started his own establishment. The funeral records were given to The Genealogical Society of Pennsylvania by descendants of the family. They have been organized into 9 volumes of burial records beginning in 1841, 3 volumes of Lot Books, (some for the Union Harmony Cemetery 1828-1915 and Hanover Burial Ground 1840-1900) and 3 volumes of Account Books of miscellaneous dates. 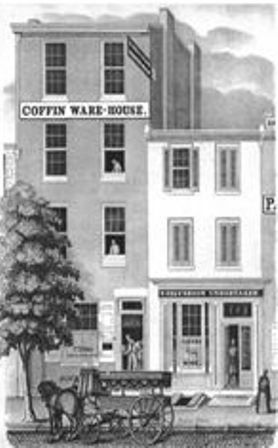 The Helversons also owned a coffin warehouse at 93 Coates Street, next to their residence and business at 91 Coates Street. These street numbers changed to 227 and 225 Coates Street in 1857. There is more information about the Helverson business and the records at the beginning of volume 1 of the Burial Records. If you find an entry in the indexes for anyone whom you think may have been an ancestor and would like a copy of the record, please contact GSP at info@genpa.org, with the request as “Copy of Helverson Record” as the subject line of the e-mail.